Each time my rucksack is packed, my flask filled, sandwiches made, and I set off for a day on the fells, I am starting out on a new adventure. When I try to explain why I like to roam about on the hills and moors, I speak of visits to a landscape immersed in romanticism; I tell of the sublime feeling when I stand on the lip of a high crag or deep inside the cathedral like chasm of Gordale Scar. The exhilaration when I am searching for the “hard to find” rock carvings on Boulsworth Hill or the anticipation of trying to locate a crashed aircraft in the hills. Since my retirement from work, each week I have made an effort to find time for a midweek walk, and very often I choose to set myself an objective to be achieved during the course of the walk. I have found this way of planning a day's walking will often provide me with a very rewarding walk. Many times my goal will be the site of a Second World War aircraft wreck such as the wreck of the Lancaster bomber on Tintwhistle Knarr in the Peak District. Because I had an incorrect grid reference for the location of this wreck, I made three visits to the area before I finally found it. When I came over a peat covered hillock and found it before me in a gully, I experienced a great feeling of satisfaction and a great sense of sadness for the seven airmen who lost their lives there. Boulsworth Hill is an area that I have often visited with the purpose of searching for prehistoric carvings hidden away in a cave formed by fallen rocks. The carvings, an Elk and a running Bison were discovered in the summer of 1920 by two teenage boys playing in the rocks on Boulsworth Moor. 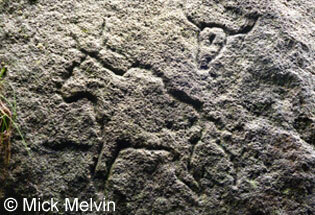 Local antiquarians are sceptical about the origins and age of these carvings. After much searching I finally found the two carvings with the help of a friend, see photo right. Like many people before me I have been asked to keep the location secret in order to protect them. Long before the “right to roam” legislation opened up the countryside, walking boundaries held an attraction for me. There is something outstanding for me following a watershed, and to walk the watershed which follows the tops of the Pennine Hills is exceptional. To walk the ridge from Hoof Stones Height, along Black Hameldon to Gorple Stones with the knowledge that the streams that course twenty feet to the east of you end up in the North Sea, and the streams flowing twenty feet to the west disgorge into the Irish Sea is special. For many walkers a visit to Top Withins or Wycoller makes a fascinating day out because of the apparent association with the Bronte sisters. I have long held an interest in visiting the setting of well known poems such as Ullswater or the village of Grantchester, accordingly a walk in the countryside around Mytholmroyd with its echoes of Ted Hughes provides me with an absorbing day out. I was particularly ensnared by a visit to Crimsworth Dean and Lumb Hole waterfall when I read the plaque which had been placed there by the Elmet Trust, a group which celebrates the life and work of the Poet Ted Hughes. The plaque tells the story of Hughes' poem “Six Young Men” and how he was moved to write it, when he found a photograph in his dead father's possessions, which shows a group of young men sitting in a country glade, all of them in obvious good humour. The poem describes in graphic detail how, within six months of the photo being taken all had met their death during World War One. When I first saw the plaque I was consumed with a curiosity about the men, which was only satisfied when I met with Donald Crossley, a boyhood friend of Hughes who kindly returned with me to the spot where it was taken, he showed me the original photograph and we talked about the poet and his work. I could write a great deal more about the reasons why I like walking, such as visits to caves and potholes, lead mines, old ruins like Staups mill in Jumble Hole Clough, but I will save these for another date.